Jedidiah's Jerky is a brand of Jedidiah's Jerky and Gourmet Snacks of Laughlin, NV. It's a family run business headed by David Coffey, who's been in the jerky sales business since 1984 with various other brands, and who's father was also in the jerky biz. This particular habanero chipotle variety was just recently released last month, and is part of Jedidiah's "Premium" line, which includes six other varieties, all of which I've reviewed here. However, as of this writing the habanero chipotle is not yet listed on Jedidiah's website. I guessing you can still call them on their toll-free number and get it. I'm noticing more jerky brands coming out with varieties that include the word "habanero" or "chipotle", or in this case both. The quest for firey hot jerky seems to have a unique following among the hot sauce community. 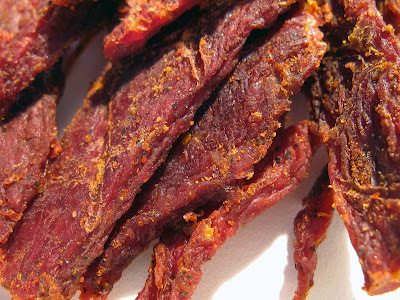 Several hot sauce fan sites include reviews for spicy hot jerky. And since the habanero pepper is one of the hottest peppers around, I'm bracing myself for a serious tongue-scorching. The tastes I pick up from the surface include a moderate sweet flavor, some chipotle flavor, a good spicy tingle, a garlic flavor, and a moderate salt flavor. In the chewing, I taste some heavier salt flavor, the natural meat flavors, and a chile pepper taste. My initial thoughts as I continue chewing is that this jerky has a lot of taste intensity, which I've found to be consistent with all of Jedidiah's Premium line of jerky. And like the rest of that Premium line, this jerky has something of a BBQ flavor to it. I'm not sure what ingredients create that flavor, but if you can imagine eating a steak basted with BBQ sauce, and then grilled, it's a similar taste. As for that spicy hot, it's got a decent burn but is not all that hot. On my scale, I'd rank it as medium. Though I'm used to eating spicy foods, so that might be a medium-hot to some of you. So does this taste anything like habanero chipotle? Well on the surface of these pieces I can get a well-defined smoky-chile flavor which does seem to resemble chipotle. I don't necessarily get much of that flavor in the chewing. As for tasting the habanero pepper itself, all I can say is that I do taste a chile pepper flavor in the chewing, aside from the chile burn. I can't say that it tastes specifically like habanero, it could be any kind of chile pepper. But it's clearly a chile pepper flavor. The natural meat flavors are evident, but you're not going to get a strong one. It's just enough to rise up above the other flavors and be enjoyed. I can also taste some the fat in this meat. There is some visible pieces of fat on this jerky, but it tastes like there a good deal of marbilization that you may not be able to see. I mentioned tasting a moderate sweet flavor in this. That perhaps contributes to the overall BBQ flavor, I can taste it about half-way through the chewing. There's also a good deal of garlic flavor in this also, which perhaps also adds to the BBQ-like flavor. I can taste it on the surface, all the way through the chewing, and it leaves behind an aftertaste. The level of salt intensity seems moderate to high. I think it's actually around moderate, but it might seem high only because the flavor gets exacerbated by the spicy hot burn from the habanero chipotle. I think I can even detect some black pepper in this. Overall, primary flavor of this jerky is that BBQ sauce-like flavor, with the natural meat flavors being second-most dominant, and the salt being third-most. While the chipotle, and chile pepper flavor is clearly identifiable, along with its burn, I feel that the BBQ, meat, and salt still comprise the dominant flavors overall, from the surface and all the way through the chewing. I do see a fair amount of fat on this jerky, and can even taste it. Where I can't see any fat, I can still taste it, perhaps meaning there's a good deal of marbilization. For the most part however, I don't really see this as spoiling the flavor. It actually enhances it, giving it a more beef-like flavor. But I didn't find any chewy connective tissues like tendon or gristle. Jedidiah's sells all of their Premium varieties of jerky from their website at a price of $6.99 for a 3.5 ounce bag. That works out to a price of $2.00 per ounce, putting this on the border between average and expensive. For general jerky snacking purposes, and at this price, it's a good value. I found this to be very snackable with its flavor intensity and flavor complexity, as well as being easy to eat and having a good chewing texture. I actually like the BBQ-like flavor, the light-but-identifiable meat flavors, and the well-noticed chipotle flavor. As a habanero chipole variety, it's another good value. I do indeed taste something on the surface of these pieces that resembles chipotle, and in the chewing I can taste something that resembles chile peppers. I can't say that it has the unique flavor of habanero, all I can say is that it's some kind of chile pepper. For all I know, it may just be some kind of red chile, or jalapeno. But it definitely offers a medium-level burn. Flavor intensity is the first thing that comes to mind with this jerky; it has a ton of flavor in each bite. And there's the flavor complexity too. I can identify several different flavors in each bite, from the sugar, the garlic, the meat, the fat marbilization, the salt, the chipotle, the chile pepper, and even some black pepper. And then the fact that I can still taste the natural meat flavors, is particularly what strengthens the "best" rating. 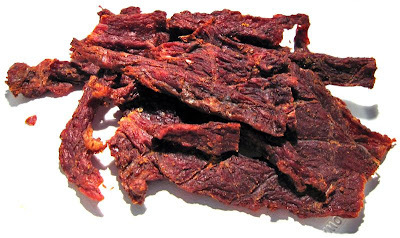 What you have here is a jerky that starts with a natural meat flavor, adds a BBQ-like flavor, packs in a lot of flavor intensity, and complexity, and on top of that stands up to its advertised flavor. And if that's not enough, it's easy to eat, and has a good chewing texture. If there's any negative in this, the salt intensity is somewhat on the high side. But I'm not totally certain of that. The saltiness is definitely a major flavor in this jerky, but it may feel more salty due to the burn from the chiles. My beer recommendation is to try a hefeweizen or wheat beer. I don't know if my bag is outside the average but when I tried this the flavors were very subtle. The heat crept up slowly instead of providing a burst of flavor. I really enjoyed it but all of the reviews I read for this particular flavor seem to be the opposite of my experience. I have 3 more bags so we'll see how the next one tastes.